I saw this picture online & fell in love with it. So precious. This year I’m making a personal goal to get more involved in the awareness of Spina Bifida. I used to be more involved in the Spina Bifida Association when we had a local chapter, but the closest chapter is now in Indianapolis. Obviously living with Spina Bifida makes it close to my heart. It’s something I think about every day; some good days, some bad days. It’s the reason this blog came to life and it’s the reason for becoming the woman I am today. Over 2013 I want to raise more awareness and I would like your help. October is Spina Bifida Awareness month and I’d like to do a big awareness party where all of you will be invited. I want to educate you between now and then so that when October hits we can spread awareness about the disability with confidence. I don’t want a pink ribbon to be the only ribbon we see during the month of October; let’s get those pale yellow ribbons familiarized with people. 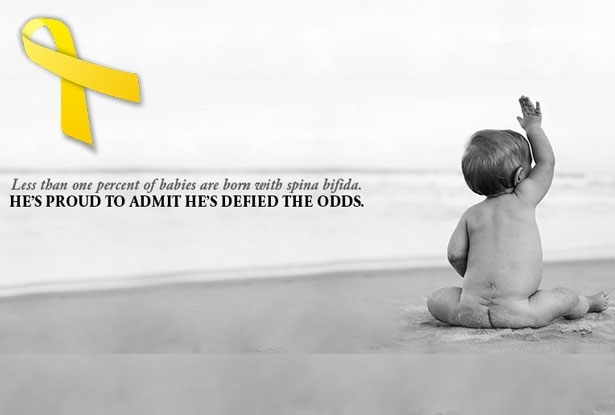 Spina Bifida is the most common, permanently disabling birth defect in the United States. The neural tube defect (NTD), a group of serious conditions of the brain and spinal cord, affects one out of every 1,000 newborns in America. NTDs, like Spina Bifida, occur during the first month of pregnancy – before most women even know they are pregnant. Spina Bifida literally means “split spine." Put simply, Spina Bifida occurs when the spinal column of the developing baby does not close completely while still in the womb; the spinal cord and back bones do not form as they should. When this happens, a sac of fluid comes through an opening in the developing baby's back, damaging part of the spinal cord. -Each day, an average of 8 babies are born with Spina Bifida or a similar defect of the brain and spine. That amounts to approximately 3,000 pregnancies each year. -There are 65 million women at risk of having a baby born with Spina Bifida. -An estimated 166,000 people currently live with Spina Bifida and I am one of them. The effects of Spina Bifida are different for every person and depend on the location of the lesion. It is a medically complex birth defect affecting the orthopedic, urologic and central nervous systems. Conditions may include paralysis of the legs, loss of bowel and bladder control, learning disabilities, depression, latex allergy, and social and sexual issues. An estimated 90% of children with the most severe form of Spina Bifida, myelomeningocele, also have hydrocephalus (fluid on the brain) which requires surgery to insert a “shunt” that helps drain the fluid – the shunt stays in place for the lifetime of the person and often requires surgical revisions or replacements. As recently as 35 years ago, most babies born with Spina Bifida died. It wasn't until the early 1970s that babies diagnosed with Spina Bifida started surviving in numbers never before seen. Thanks to new medical treatments and technology, today, 90% of infants born with Spina Bifida live – many go on to lead successful and productive lives. People with Spina Bifida have many challenges because of their disability, but their condition does not define who they are – they go to school, have careers, play sports, get married, and have children just like people who do not have Spina Bifida. The exact cause of Spina Bifida is unknown. However, scientists believe a combination of genetics and environmental factors are involved. Daily consumption of the B-vitamin, folic acid, and prior to and during pregnancy is shown to reduce the occurrence of Spina Bifida by up to 70%. Folic acid helps build healthy cells. It is important for all women of childbearing age to take a vitamin with folic acid every day, particularly women with Spina Bifida. For more information on Spina Bifida please visit here. Over the course of this year I will provide ways for you to get involved in Spina Bifida Awareness. For ways to get involved today please visit the Spina Bifida Association Website. If you have any questions or any ideas on how to raise local awareness about Spina Bifida please contact me or leave a comment below. I’m looking forward to seeing my amazing readers get involved in a topic that is so very dear to my heart. Please feel free to share this blog to anyone who you think would be willing to get involved. 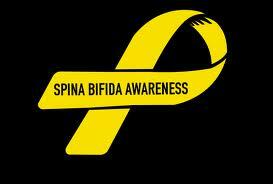 Let’s make 2013 a better year for Spina Bifida Awareness.